MAKE YOUR CASE EVEN STRONGER As an alum, you know the level of innovation Case Western Reserve University brings to the world. Help increase your professional effectiveness by earning your master’s degree from your alma mater—100 percent online. Reach out today to learn if you qualify for a scholarship by calling 216-672-4614. Start This Fall! Apply by July 21 to begin September 5. 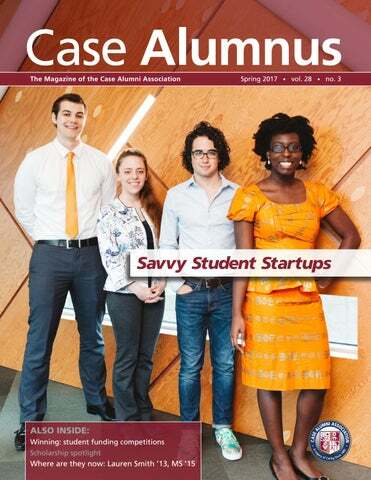 ON THE COVER: Student startup superstars, from left to right: Pavel Galchenko ’19 of RVS Rubber Solutions; Matt Campagna ’19 of Reflexion Interactive Technologies; Iulia Barbur ’19 of Autoimmune Citizen Science; and Chioma Onukwuire ’17 of CHIMU. Case Connections 2017 ALL IN Day of Giving The Case Alumni Association and the Case School of Engineering are proud partners in the fifth annual Day of Giving planned at Case Western Reserve University on Wednesday, June 14, 2017. We are asking all alumni, faculty, staff and students to consider making a gift to the Case Fund® that day. Each school is given a participation goal, and if we meet the targeted number of donors (179 for us), we will earn additional dollars from the university! Mark your calendars and watch our social media sites, email and websites to learn more. If you are interested in volunteering that day to help push out the message using #CWRUALLIN, please contact Ryan Strine, the manager of the annual fund at ryan.strine@casealum.org or 216.368.6399. CWRU students win 2 of top 3 awards at South by Southwest’s ‘Student Startup Madness’ Two Case Western Reserve University student startups won two of the top three awards earlier this spring in the “Student Startup Madness” championship at the South by Southwest conference in Austin, Texas. Parihug, co-founded by second-year mechanical and aerospace engineering student Xyla Foxlin, placed second winning a $3,000 award. Reflexion Interactive Technologies, co-founded by Matt Campagna, placed third, winning a $2,000 award. They were among eight finalists competing in a pitch competition that started with a pool of 200 entries. Continuing Legacy Congratulations to the 2017 recipients of the Richard ’39 and Opal Vanderhoof Scholarship and Prize Fund for undergraduate and graduate civil engineering students. The 2017 recipients are Ben Allan, Nicolas Heim, Jacob Lunn and Lauren Rendos. CWRU selected as one of nation’s top 10 centers for biomedical research The Hartwell Foundation, a Memphis-based philanthropic institution that funds innovative biomedical research to benefit children of the United States, has again selected Case Western Reserve University among its 2017 Top 10 Centers of Biomedical Research. The other 2017 Hartwell Top 10 Research Centers include Cornell University, Duke University, St. Jude Children’s Research Hospital, Johns Hopkins University, University of California, Davis, University of California, San Diego, University of Texas Southwestern Medical Center, University of Virginia and University of Wisconsin-Madison. “In addition to the honor of being identified with such an elite group of research universities, the national designation allows us to submit three nominees next year instead of two, so we will have a greater chance to obtain funding,” said Lynn Singer, deputy provost and vice president for academic affairs. Additionally, by participating in the 2017 competition Case Western Reserve is positioned to qualify for a Hartwell postdoctoral fellowship. For each CWRU nominee selected for a 2017 Individual Biomedical Research Award, the university will receive funding for one postdoctoral candidate of its choice in biomedical science that exemplifies the values of The Hartwell Foundation. More accolades for Dean Jeffrey L. Duerk PhD ’87 Jeffrey L. Duerk, dean of the Case School of Engineering, has been elected by his colleagues in the College of Fellows in the American Institute for Medical and Biological Engineering to serve as a member of the organization’s Board of Directors as a director-at-large. AIMBE is a nonprofit organization representing the top 2 percent of researchers and scholars in the field. Founded in 1991, the organization serves as an advocate for public policy issues related to improving lives through medical and biological engineering. As director-at-large, Duerk will help set strategic priorities for AIMBE and direct the course of the organization’s future. Duerk has served in a number of key leadership positions in professional organizations during his career, including as president of the International Society for Magnetic Resonance in Medicine, chair of the 2004 ISMRM Program Committee (Kyoto, Japan), treasurer of the ISMRM, editor-in-chief of Magnetic Resonance in Medicine, and member of the ISMRM Board of Trustees and a 2011 recipient of its Silver Medal. He has also served as the chair of the Program Committee for the IEEE-EMBS flagship annual meeting in Chicago, 2014, a member of the EMBS Ad-Com, IEEE-TMI and IEEE-TBME reviewer over many years. He is a fellow of the IEEE, the ISMRM, AIMBE and the NAI, and a member of the inaugural class of Distinguished Researchers of the Academy of Radiology Research. Student startups utilize campus resources to achieve early success By Terri Mrosko from the U.S. Department of Energy. “This money will be used to engineer the factory-scale prototype and is one of the last steps before going into full production,” Pavel said. Pavel utilized extensively the services of the IP Venture Clinic through the law school and housed at Sears think[box]. “CWRU LaunchNet also has been a great help, and we love the collaboration space that think[box] has provided us as well as the office space we have there,” he said. The Reflexion Interactive Technologies system rapid-screens for concussions Every year 50 million young amateur athletes may compete or practice with a concussion, mainly because their schools and athletic organizations do not have access to an inexpensive and fast way to detect traumatic brain injuries. A high school friend’s sports injury ultimately deemed a concussion that sidelined him for a couple of months prompted Matt Campagna to seek a solution. The computer engineering major started his company with two high school friends from Lancaster, Pennsylvania, who now attend other universities. Using the Reflexion Edge, in only 30 seconds a return-to-play decision can be made. More startup success stories Many successful alumni startups began while they were still students at Case. These companies include EveryKey by 2013 computer science graduate Chris Wentz and Apollo Medical Devices, cofounded by Punkaj Ahuja ’09, MS ’11, among so many others too numerous to name! Case Alumnus caught up with a couple of our more recent graduates to learn more about their companies. Nick VanDillen of LYGENT and Nathan Swift of Hedgemon both graduated last May. “I can’t take credit for coming up with the invention, as it was invented by Dr. Jeffrey Bloom in 2011,” VanDillen said. “While I was a student, my mentor, Dr. Colin Drummond, brought to my attention a promising project that had been taking place between Case and University Hospitals. A student team working with Dr. Bloom at University Hospitals had invented the technology that would eventually become the iStrab in 2011.” Unfortunately, Dr. Bloom passed away in 2012 leaving the project without a leader. VanDillen got in contact with the remaining team members and started up the project again. LYGENT is currently raising funding for the iStrab and preparing clinical trials for Food and Drug Administration notification. entrepreneur, Swift received help from his graduate adviser, Ed Caner, who helped guide the company by discussing priorities, strategizing business funds and suggesting directions for growth. The main focus for Hedgemon is on designing a sports helmet liner to better reduce, or even eliminate, incidents of concussions. The design, of course, is based on the spines of a hedgehog. Right now Swift says Hedgemon is in “full-on prototyping mode,” after collecting data on various samples. aint-Gobain, EEC IdeaLabs, DigitalC Impact Pitch, eFest, Startup Battlefield, LaunchTown – these are just some of the design competitions open to students with a viable product, design or innovation. Every competition is different but all come with a hard deadline and some with the possibility of thousands of dollars in prize money. “The university also gains national accolades by our students finishing high in these competitions, as has been the case over the last couple of years. Oftentimes the national spotlight leads to attention from potential investors,” Sopko said. LaunchNet publishes an ever-increasing list of competitions and deadlines, while helping students prepare for the specifics of each competition. How should the PowerPoint look? What things should they key in on? How do they get resources to build the prototype? Sopko said LaunchNet also provides emotional support and sometimes even financial support. The payoff at times can be huge. Some students have won tens of thousands of dollars, nice seed money for a startup. n the last issue of the Case Alumnus magazine, and via several other avenues, we introduced the Alumni Career Network mentoring program, powered by Wisr, a networking platform developed by alumnus John Knific ’09 and used across campus. Since that time, some 400 engineering, mathematics and applied science alumni signed up and are available for students to reach out to for a virtual mentoring session. We asked two of those alumni volunteers to share some about their experience using the system to connect with a student. Kyle Napierkowski ’09, MS ’09 heard about the program through the Weatherhead School of Management newsletter. He said two students reached out to him within a couple weeks of signing up and feels he had a meaningful connection with them. What were your majors at Case? I received a Master of Science degree in mechanical engineering and Bachelor of Science degrees in aerospace engineering and mechanical engineering, with a minor in political science. People often ask about the political science minor – “What does that have to do with engineering?” I always knew I wanted to be in aerospace and defense and saw value in having a foundational understanding of the U.S. government. Where else did you work prior to you current position? I recently relocated to Redondo Beach, California, with Northrop Grumman, but I began with the company in San Diego. Most recently, I was the program manager of Quad Cup – the company’s 2016 Innovation Challenge. Quad Cup united employees from across the country to compete in a first-of-its-kind quadcopter sporting event. Teams took risks, had fun, and demonstrated critical new technologies. You can find more information about the final event online! Before Quad Cup, I was a concept development engineer inventing disruptive autonomous systems. Prior to Northrop, I worked at NASA Glenn Research Center in the Simulated Lunar Operations (SLOPE) Lab. I also conducted my thesis work at Glenn and developed a novel locomotion mechanism called the Tri-Wheel that increases robot mobility on search and rescue vehicles. Describe your current position: I am a program manager within NG Next, an organization within Northrop Grumman Aerospace Systems tasked with solving the customer’s hardest problems and pursuing technologies that are often riskier, less well defined or nonexistent. I love being in the front end of the business – meaning that I get to think about the future of the company and the industry many years out. Program management stretches all your muscles – technical, management, business, strategic ... I have incredible mentors and colleagues here at Northrop to help me grow in all these areas. You recently gave a keynote presentation at the Society of Women Engineers annual Engineers Week luncheon. How did this opportunity resonate with you? It was incredibly humbling to be this year’s E-Week keynote speaker. Not long ago, I was a student sitting in the audience at that event, so to have made a full transition to industry and be back in Cleveland sharing my experience was surreal. I think there is a common misconception associated with keynote speakers – that they have things ‘figured out’ and as such should share their ‘figured-out-ness’ with everyone else. Let me pull back the curtain: nobody has it all together. Everyone faces challenges, self-doubt, and uncertainty; the interesting part is how you walk through the fire and come out the other side. So, when asked to speak, I shared lessons learned from my own challenges – moving across the country to California where I had no existing support system, taking on a huge stretch assignment with high visibility and risk in a new company, and making the choice to move again from San Diego to Redondo just when I felt comfortable. I hope that my experiences provided inspiration to others to take risks and be bold. One quote is always a good reminder for me: “You are braver than you believe, stronger than you seem, and smarter than you think.” – A. A. Milne “The coolest thing I did during my time at Case was …” … being a teaching assistant! I taught four different courses in my time at Case and actually wanted to be a professor for some time because I loved it so much. Seeing that lightbulb of understanding go off for someone was tremendously rewarding, and I learned the material better myself for having to teach it. “My Case education …” … has shaped who I am in so many ways. It is crazy to consider what life might look like today if I had not attended Case. From courses that challenged me to friends who will be in my life forever, a piece of my heart will always be in Cleveland, Ohio. My Case education also would not have been possible without the tremendous generosity of others. I was the recipient of the Milton A. and Roslyn Z. Wolf Scholarship (CIT ’54, GRS ’73, CWR’80, GRS’93) as well as the Ohio Space Grant Consortium Fellowship. “My advice for today’s Case Junior/Senior Scholarship students …” Be intentional: consider carefully how you spend your time, who you spend it with and whether that aligns with what you want out of life. If current behavior does not support your goals, be brave enough to make a change. Don’t sit back and wait for opportunity to find you – hunt it with tenacity. Your GPA is only one facet of what you offer a future employer, and you cannot underestimate the importance of building relationships with people to go places in your career. Lastly, results are considered in context; how you treat others to achieve results matters. Alumni Engagement Update Case on Location: San Francisco, CA – March 16, 2017 The Case Alumni Association, in conjunction with Weatherhead School of Management and the Alumni Association of Case Western Reserve University, hosted an “Insights into Pitching Startups” panel discussion and networking event at The Battery in San Francisco. Weatherhead School of Management Professor Scott Shane shared findings from recent experiments he conducted training founders how to pitch to accredited investors. Following his talk, a panel of Case Western Reserve alumni shared their experience evaluating start-up pitches and discussed what works, and what does not work, when pitching investors. Engineering alumnus, Eric Ver Ploeg ’88 was among the expert panelists that evening. He is an individual venture investor with Ver Ploeg Venture Syndicate. Oil and Gas Industry Energy Forum – April 6, 2017 We had a full-capacity crowd of 300 students, alumni and guests at our April 6 event. Thank you again to the Case Alumni Association President Jeffrey Herzog ‘79, WSM ’86 for bringing the idea to our attention. Thank you to our wonderful alumni panelists, who gave a great overview of the industry and the role their Case education played in their career success. And thank you to all who offered feedback on this important industry event. It has sparked a request for another event in the future. George Havens wrote an inspiring new book proclaiming the critical values of heroes. The thrust of the book is that life can be richer, and more upbeat, with the benefit of heroes who expand our lives by giving us examples to emulate and idealize. This is the seventh book that George has written since retiring as the head of the Jayme Organization, an advertising and marketing firm. He now heads Strategic Consulting, a firm focused on leadership, planning and marketing. George is a member of the Cleveland Advertising Hall of Fame. 1950s Howard E. Conlon ’52, MS ’63 Ann Arbor, Michigan Howard recently retired as an emeritus faculty member at Oklahoma State University, where he was the editor of the campus newsletter and recently chaired the campus-wide United Way drive. John R. Berry III ’67 Joppa, Maryland John fully retired this year, and now lives near the Gunpowder River, two miles from the Chesapeake Bay in Maryland. He and his wife left for South Africa at the end of March to visit kids and grandkids. John is looking forward to the 50th class reunion! Henry C. Haller ’57 Avon Lake, Ohio Hank has just released a Jubilee Polka Album entitled “Through the Years Volume 2 - Polkas Haller-Style.” He is also in the National Cleveland-Style Polka Hall of Fame. John received the 2017 American Powder Metallurgy Institute International’s Fellow Award, its most prestigious award. Shields worked with NASA to develop materials for space shuttles, refined sintered tungsten ingots to increase tungsten sheet yields, and led a team to bring a novel thermal management system for galvanic corrosion resistance to market. He is author/co-author of two U.S. patents, three books and over 30 technical papers. He received the Fellow Award from ASM International, Distinguished Service Award and was voted Engineer of the Year in 2002 by Cleveland Engineering Week. class notes Jennie S. Hwang PhD ’76 Bedford, New York Jennie was reappointed the chairperson of the board on Assessment of U.S. Army Research Laboratories for the U.S. Department of Defense, whose primary focus is on operational efficiency including planning, facilities, equipment, human resources and the merits of the technological programs in near-, medium- and far-term. Jennie is chief executive officer and principal of H-Technologies Group. James A. Ford ’88 Laguna Hills, California James received a senior radio frequency engineer II position at Raytheon Space and Airborne Systems starting in January. He previously worked at Broadcom Limited for over 10 years. 1980s Joseph F. Denk, Jr. ’84 Cleveland, Ohio This year marks the 50th anniversary of Denk Associates, Inc., a company started in 1967 by Joe Denk, Sr. ’59. His two sons, Michael Denk ’87 and Joseph Denk, Jr. ’84, now run the company. To celebrate this milestone, Denk Associates donated to the Class of 1959 50th Reunion Scholarship Fund. John P. Vourlis ’84 Wickliffe, Ohio John produced and directed the documentary feature film “Breaking Balls,” the story of three colorful local figures associated with the game of bocce, as seen through the lens of the 30th anniversary of the Cleveland Challenge Cup of Bocce Tournament, held annually in Wickliffe, Ohio. The film recently appeared at the 41st annual Cleveland International Film Festival. Michael T. Denk ’87 Kirtland, Ohio This year marks the 50th anniversary of Denk Associates, Inc., a company started in 1967 by Joe Denk, Sr. ’59. His two sons, Michael Denk ’87 and Joseph Denk, Jr. ’84, now run the company. To celebrate this milestone, Denk Associates donated to the Class of 1959 50th Reunion Scholarship Fund. advocate for public policy issues related to improving lives through medical and biological engineering. As director-at-large, Jeff will help set strategic priorities for AIMBE and direct the course of the organization’s future. Jeff is dean and the Leonard Case Professor of Engineering at Case Western Reserve University. 1990s Mark S. Haberbusch ’90, MS ’93 Amherst, Ohio Mark started a company called NEOEx Systems, a platform to collect relevant data from unmanned aerial vehicles that will use lightweight hydrogen fuel and energy-efficient fuel cells to effectively power the UAVs for up to 50 hours without the need to refuel. NEOEx is reaching the prototype stage and the goal is for commercial application to take place within the next two years, in parallel with the Federal Aviation Administration as it continues to release regulations for commercial unmanned drone operations in the national airspace. Srikantan S. Nagarajan MS ’91, PhD ’95 San Francisco, California Srikantan was named an Institute of Electrical and Electronics Engineers Fellow for his contributions to neural engineering and biomagnetic brain imaging. The honor is the highest grade of membership and recognized by the technical community as a prestigious honor and an important career achievement. class notes Mary J. Lobo ’99 Cleveland, Ohio Mary was featured in a story by Cleveland’s Plain Dealer newspaper in February. Mary is the space simulation facility manager at NASA Glenn’s Lewis Field campus responsible for coordinating internal and external tests in over two dozen vacuum chambers and the strategic planning to enable the chambers to be ready to support NASA future missions. 2010s Bo Li PhD ’11 Cleveland, Ohio Bo, an assistant professor in the Department of Mechanical and Aerospace Engineering at Case Western Reserve University, received $500,000 of National Science Foundation grant money to develop computational tools to enable manufacturers to run thousands of simulations at one time to predict quantitatively what combinations of metals, manufacturing parameters and more will lead to the optimal product. Christopher J. Krimball ’16 Scottsdale, Arizona C.J., a former men’s tennis player, received the NCAA Today’s Top 10 Award recognizing former student-athletes for their successes on the field, in the classroom and in the community, at the Honors Celebration during the NCAA Convention in Nashville, Tennessee. C.J. is the first athlete in Case Western Reserve University history to win the honor, one of the most prestigious awards that can be presented to an NCAA athlete. Since his graduation in May, C.J. has worked as a project engineer at Avery-Dennison in Cleveland. Christopher R. Kerr ’07 Medina, Ohio Chris started a new job at Riverside Partners, a private equity company in Downtown Cleveland. Chris also had his first child, a daughter named Kennedy, with his wife Jessica. In the last issue of Case Alumnus, we reported the passing of Larry E. Thomas of Titusville, Florida on August 7, 2016. The correct name is Larry E. Thompson ’61. We sincerely regret the error. f you were to ask a random Case Western Reserve University student about the school’s athletics programs, they would probably be confused. “We have varsity sports?” they might ask, giving you the facial expression of anyone trying to take an organic chemistry exam. Yes, Case Western Reserve does have varsity teams, 17 in fact. Almost 500 student-athletes are on rosters for those teams, around 10 percent of the undergraduate population. Another student response might be to question how good the teams really are. A relatively small university known for making geek chic cannot possibly have good sports teams. Can it? Yet the opposite is true. Did you know the football team started the 2016 season with nine straight victories? Or both the men’s and women’s tennis teams are consistently ranked in the top 20 in the country? Or the baseball team earned a trip to the National Collegiate Athletic Association championship at the end of the 2016 season? Or that cross-country runner Sam Merriman (CWRU ’18) finished 21st at the NCAA championships, earning All-American status? Or even that thrower Cassandra Laios (CWRU ’18) and sprinter Nathaniel Wahner (CWRU ’17) both won multiple University Athletic Association titles this year? Probably not. Small home crowds are the reason behind the ignorance. For the eight sports that tabulate attendance, the average number of people at a Spartans’ home game is 352. Excluding football (1,706 spectators per home game), that average plummets to 159. It is also safe to assume that a sizeable percentage of those home crowds are parents or alumni. And, since many of the universities the Spartans face are located close to Cleveland, parents of opponents attend as well. Thus, the average number of Case Western Reserve students at games is probably in the low double digits. The sports that do not count attendance are more than likely the least popular among students. Those include tennis, swimming and diving, track and field, cross-country and wrestling. However, it is in those sports, particularly tennis and track, that Spartans shine the most. A lack of school spirit has been a problem for Case Western Reserve for a while now. I don’t blame students for not attending games that last multiple hours when, they have other, more important commitments like research, jobs or exams. However, I do blame them for not being aware of what is going on. Case Western Reserve sports teams actually do really well. Every year since 1998, the school has produced at least one All-American. Since the federation, the school has claimed 18 national champions as well. And when Spartan athletes do well, the whole university does well, even alumni. There is a reason “CWRU” is on all of the team’s jerseys: the athletes are competing for the school. One of these days, Case Western Reserve is going to win another national championship. Perhaps then, the student body will begin to recognize that the university teams do indeed exist and are good at what they do. And maybe, just maybe, more students will respond with pride instead of confusion. What say you, Spartans fans? It’s not too late to support the Case Fund®! Want to make a larger gift but can’t pay all at once? Choose the online monthly giving option!